The Bois Forte Reservation is located in northeastern Minnesota. The Reservation consists of three parts. The largest section is at Nett Lake in St. Louis and Koochiching counties. It is home to the majority of Bois Forte Band members and the Band’s Tribal Government Offices. The Vermilion Reservation is located near the city of Tower on Lake Vermilion in St. Louis County. It is home to Fortune Bay Resort Casino, the Bois Forte Heritage Center, the Vermilion Family Wellness Center and the Vermilion Community Center and Health/Dental Clinics. Deer Creek in Itasca County is also part of the Bois Forte Reservation although no Band members live there. To obtain Indian people’s rich land and natural resources, the U.S. government signed a series of treaties with Indian nations in the 1700s and 1800s. Under the terms of the Treaty of 1854, Indian people in northern Minnesota ceded land from International Falls to Duluth to Grand Portage. The Bois Forte Indians were given the right to select reservation lands in the vicinity of Lake Vermilion, which was the heart of their community, and they retained the right to hunt and fish in the ceded area. But when reports of gold beneath the Bois Forte people’s lands began to circulate, non-Indians wanted the land. That led to the Treaty of 1866, in which all claims to a reservation near Lake Vermilion were relinquished and a reservation of about 100,000 acres was established at Nett Lake. Even though the Vermilion reservation was reestablished by an 1881 Executive Order, the Bois Forte Indians were only given back about 1,000 acres in the Vermilion area, instead of the tens of thousands they had been promised in the Treaty of 1854. The Fond du Lac Reservation is located in Carlton and St. Louis counties about adjacent to the City of Cloquet on the east, and 15 miles west of Duluth. The tribal headquarters are in Cloquet, Minnesota. The LaPointe Treaty of September 24, 1854 (10 Stat. 1109) was the last principal treaty between the several bands of Chippewa inhabiting Northern Minnesota, Northern Wisconsin, and the Western Upper Peninsula of Michigan. In this treaty, the various bands of Lake Superior and Mississippi Chippewa ceded approximately 25% of the land areas of the present states of Minnesota and Wisconsin plus the balance of the Upper Peninsula of Michigan to the United States. The LaPointe Treaty established the Fond du Lac Reservation at 100,000 acres. The Leech Lake Reservation is located in north central Minnesota in the counties of Beltrami, Cass, Hubbard, and Itasca. The tribal headquarters is in Cass Lake, Minnesota. Located along US Highway 2, the reservation is southeast of Bemidji with Walker just outside on the southwest corner. Cass Lake is the largest community within the reservation. Eleven communities make up the reservation. In addition to Cass Lake, there are Ball Club, Bena, Inger, Onigum, Mission, Pennington, Smokey Point, Sugar Point, Oak Point, and Squaw Lake. Oak Point had previously been known as Squaw Point, but was renamed in 1995. The Mille Lacs Reservation is located in east central Minnesota, 100 miles north of Minneapolis/St. Paul. The tribal headquarters is near Onamia, Minnesota. To the Anishinabe or Chippewa who lived along its southwestern shores, Lake Mille Lacs and the surrounding land has a special significance. This part of Minnesota - where the seasons of the year bring cycles of great beauty to the Lake and the land - has been the setting of their history for more than two centuries. For miles in every direction, there is hardly a place untouched by some large or small event from their past. While the Mille Lacs Lake region is now a famed fishing and resort area, to the Anishinabe or Chippewa, it is a place where the past touches the present and connects their life with the people who came before and left a rich tribal heritage. The tribal headquarters is near Onamia, Minnesota. The reservation was established by the 1855 Treaty. The Tribe owns approximately 16,000 acres of land located within four townships on the south end of Mille Lacs Lake. Additional communities exist in Aitkin and Pine counties and three islands. The reservation has a community center, schools, clinic, museum, casino/hotel complex and Government Center. 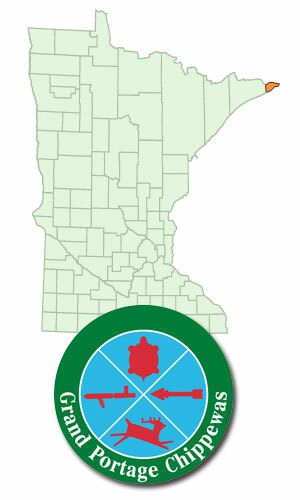 The White Earth Reservation contains 829,440 acres and is located in the northwestern Minnesota. It encompasses all of Mahnomen County and portions of Becker, and Clearwater Counties. The reservation is located 68 miles east of Fargo and 225 miles northwest of Minneapolis/St. Paul. The Tribal headquarters is located in White Earth, Minnesota. The White Earth Reservation is named for the layer of white clay underneath the surface on the western half of the reservation. The land is typical of west-central Minnesota of prairie in the west, rolling hills and many lakes and rivers in the middle, and conifer forest in the east. Indian communities include White Earth, Pine Point/Ponsford, Naytahwaush, Elbow Lake, and Rice Lake. Other villages were built along the railroad track running south to north in the western part of the reservation, Callaway, Ogema, Waubun, and Mahnomen (all incorporated cities). With the 1867 Treaty, great pressure was put on all bands in Minnesota to get them to relocate onto one reservation. Never the historic homeland of any Ojibwe group, it became a reservation in 1867 in a treaty with the Mississippi Band of Ojibwe. It was to become the home of all of the Ojibwe and Lakota in the state, however, not all bands wanted to move onto one reservation and give up their reservation. Mississippi Band members from Gull Lake were the first group to come and settle around White Earth Village in 1868. The 1920 census reflected those who had settled in White Earth: 4856 were from the Mississippi Band including 1,308 from Mille Lacs, the Pillager Bands had 1,218, Pembina Band 472, and 113 had come from Fond du Lac of the Superior Band. NOTE: The Red Lake Nation (Anishinaabe) is also located in Minnesota but is not a member of the Minnesota Chippewa Tribe. The tribal government has full sovereignty over the reservation, subject only to the federal government. Red Lake, because of its unique status is often referred to as a "closed" reservation. Because the land is held in common, few non-members live at Red Lake. The Tribe has the right to limit who can visit or live on the reservation. The Red Lake Nation is exempt from Public Law 280; consequently the state courts or government has no jurisdiction at Red Lake. Laws are made by the Tribal Council and enforced by the Tribal Council and Federal Courts. In 1918 the Red Lake General Council Constitution was established. In 1958 a revised Constitution and By-laws was adopted by the members of Red Lake Nation, followed by the first secret ballot election of Tribal Government in 1959.